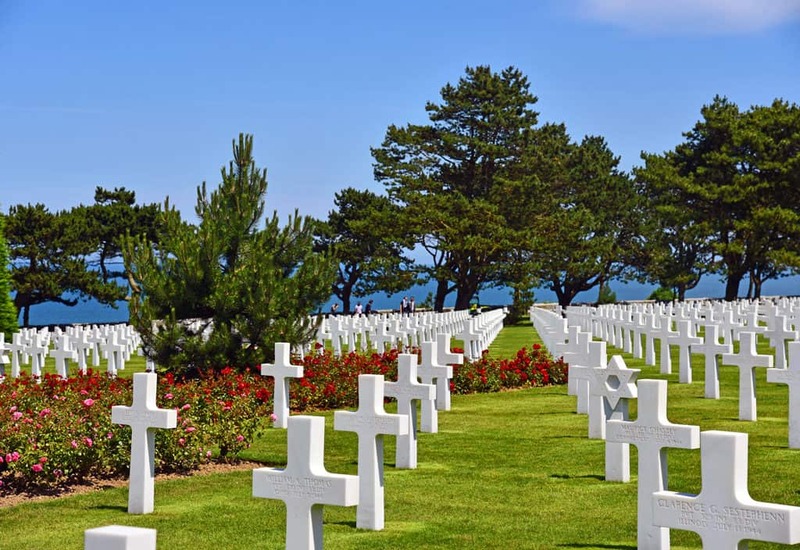 Normandy is known throughout the world as the location where the allies made their historic invasion, thus ushering the beginning of the end of World War II. It is also home to centuries of arts, culture and natural beauty. This history and culture tour will explore both aspects of this beautiful region of France. The events of June 6, 1944, continue to inspire long after the guns have fallen silent. The largest invasion in history, on the isolated Normandy coast, drastically altered the conduct of the war and demonstrated the unflinching resolve of freedom-loving peoples. This D-Day tour will bring the Cohens and Solits to the beaches, cliffs and fields; and villages, towns and cities where the Greatest Generation made their most indelible mark. From British glidermen at Pegasus Bridge, to the American infantrymen assaulting the beaches at Bloody Omaha; from American paratroopers jumping behind enemy lines at Ste Mere Eglise and Brecourt Manor to the Rangers climbing the cliffs at Pointe du Hoc to the building of the artificial harbors at Arromanches. And so many other iconic sites. 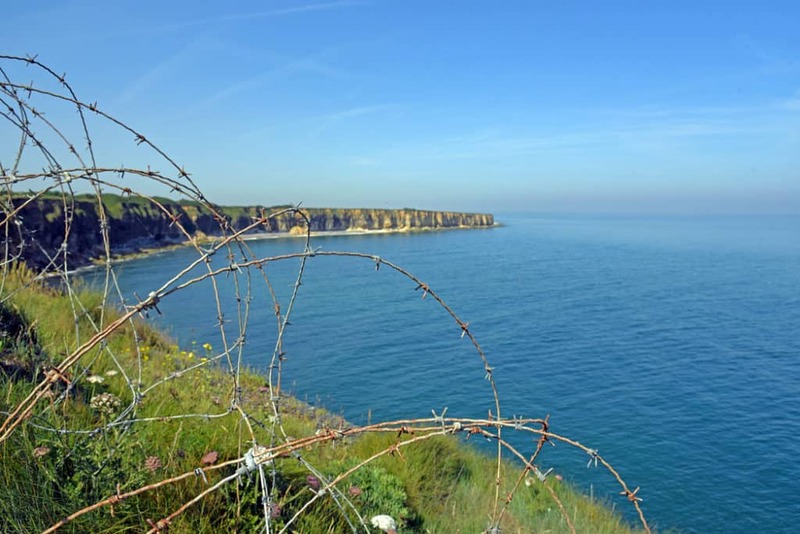 This Normandy tour unfolds over seven days and six nights with stories of all the allied participants as well as those of the German defenders. 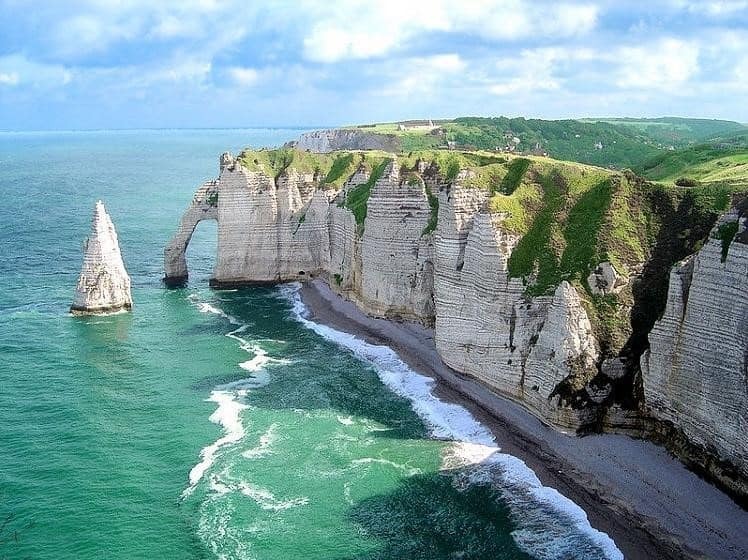 The rich, verdant farmland, the quaint villages and the dramatic cliffs and coasts create an incredibly memorable backdrop for this Normandy, France, tour. Normandy is also home to so many iconic arts and cultural monuments – from Monet’s gardens at Giverny (the home of Impressionism) to the Bayeux Tapestry that tells the tale of the Normand Conquest of England, from the seaside towns that shaped the views of artists and authors (like Flaubert’s Madame Bovary) to the abbeys and castles that shaped nations. 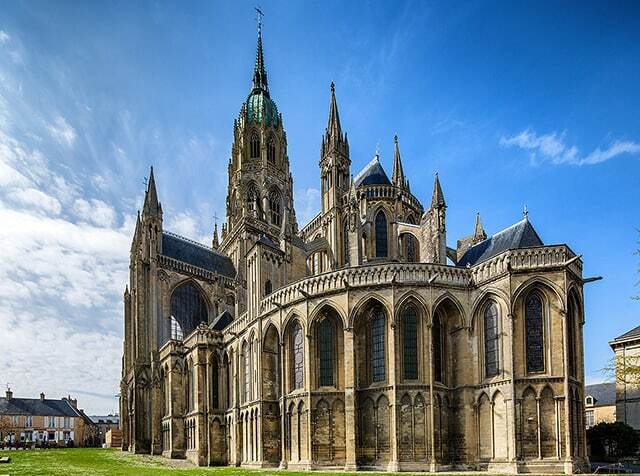 We will visit two World Heritage treasure sites – William the Conqueror’s Bayeux Tapestry, and the gorgeous Chartres Cathedral. The itinerary is unique for a visit to Normandy in that it incorporates a wealth of art and culture along with history. This trip will allow both the art-lovers and history-lovers to experience amazing sites and scenes and access stories that both will find fascinating, inspiring and enriching. Meet at your hotel in Paris at 9am for the start of the adventure! 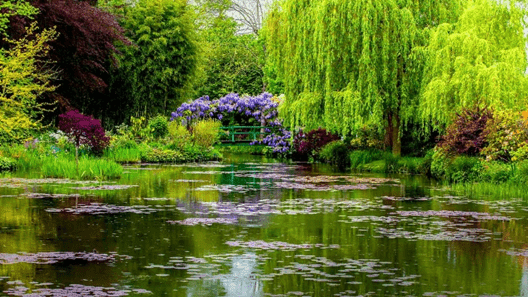 Drive along the beautiful valley of the Seine to Giverny and visit the gardens and home of Claude Monet, arguably the greatest of the Impressionist painters. Water Lilies and so many others were painted here. Visit the Musée des Impressionnismes in Giverny, dedicated to the history of the Impressionist art movement. Enjoy lunch at the café at Monet’s Giverny. 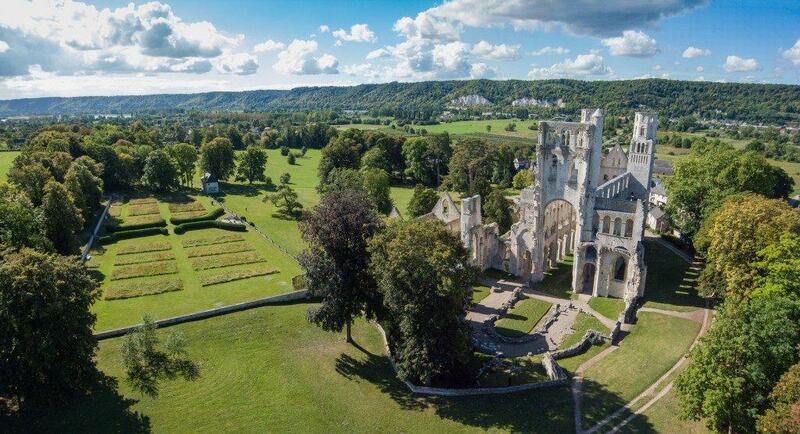 Visit the incredible abbey of Jumieges – situated on a loop of the Seine, it was founded in 654! Check in to lodgings at the delightful Ferme de la Ranconniere, originally built in the 13th century, in the country town of Crepon. Each room is unique and has been designed with loving charm. 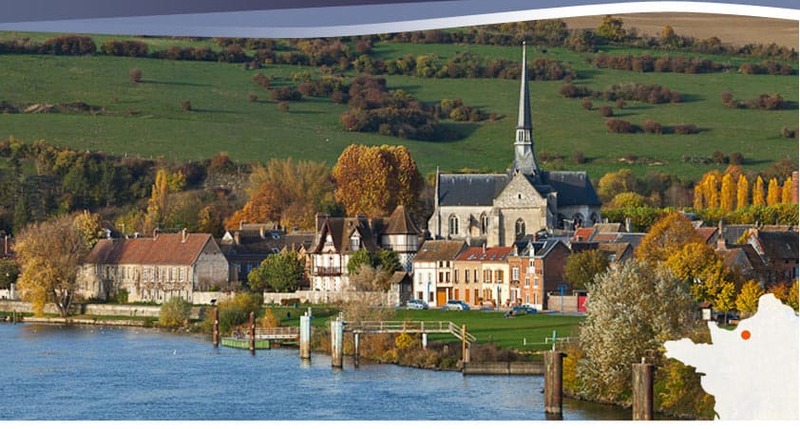 DK Eyewitness Travel lists Ranconniere as the #1 “Hotel with Character” in Normandy. Your accommodations will include two double junior suites. Five-course dinner at the charming Ferme de la Ranconniere. 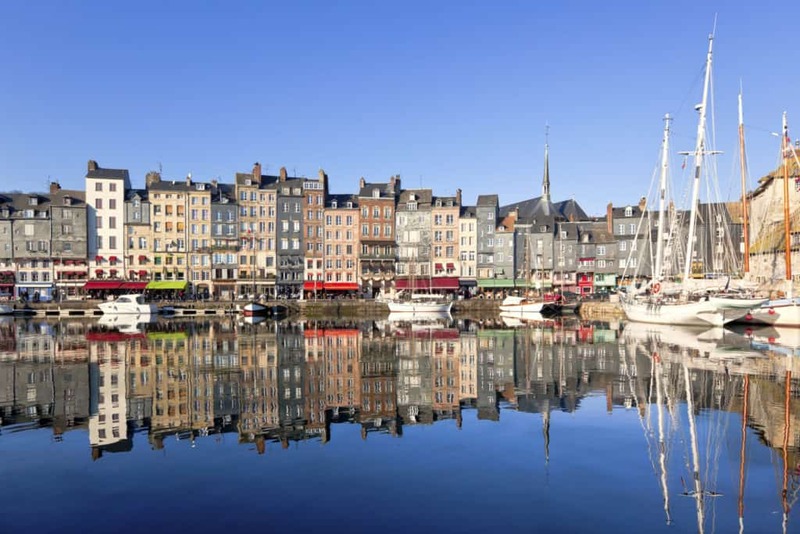 Visit charming Honfleur, the famed seaport town that served as Champlain’s jumping off point for America and numerous English and French painters over the past 200 years (including Turner, Monet and Daubigny). Visit the Parisian seashore villa towns of Deauville, Trouville and Cabourg with their beach boardwalks, casinos, horse-racing culture and quaint downtowns. For 150 years these have been the summer “escape” towns of Parisian society. Our next stop is a key location in the D-Day landings on June 6, 1944. Pegasus Bridge saw glidermen of the British 6th Airborne Division capture the key bridge over the Orne and liberate the first French house in the invasion, today’s Café Gondree, where we will enjoy a coffee and may meet the owner, Madame Arlette Gondree, who saw the invasion as a little girl. Visit the nearby Ranville British Cemetery, where the first Allied killed in action are buried. Drive along SWORD and JUNO beaches to Arromanches, the site of GOLD Beach, another British landing site for the 50th Infantry Division and the location of the British Mulberry artificial harbor. We will enjoy a social hour and dinner in historic Bayeux, in the shadow of the ancient cathedral. Drive to old town of Bayeux, where we will visit the famed Bayeux Tapestry, which has told the story of William’s conquering of England for 1,000 years! A walk through the ancient center of town will include the glorious Cathedral and medieval streets. Our final stop is Caen, the capital of Normandy since the days of William the Conqueror in 1066! We will walk the old town, including William’s Abbaye des Hommes, the Universite, and his ducal Chateau. We will also visit the city’s Jewish synagogue, built in 1966 with funding from the American Jewish Joint Distribution Committee. Dinner tonight in a quaint, fabulous restaurant in the medieval 13th century streets of Old Caen. We begin the day at the western end of the battle for Normandy. First up is the UTAH Beach Memorial with 4th Infantry Division where Americans first came ashore on June 6th. Next is the 101st Airborne Division landings near Ste Marie du Mont, and the Band of Brothers of Easy Company at Brecourt Manor. The monuments to these men are a perfect place to examine the minute tactical battle detail of Americans in combat. At La Fiere Bridge we will observe the tough defense by the 82d Airborne Division to hold the town of Ste Mere Eglise. In the quaint town of St Mere Eglise, we will discuss the 82d Airborne Division in the first French village liberated by Americans. After visiting the church, which beautifully commemorates the airborne paratroopers, and walking the town, we will enjoy lunch in a café in a town that still regards the Americans as their best friends and liberators! Our next stop is one of the most dramatic landscapes of the entire region! Marvel at the climb of the 2d Ranger Battalion up the cliffs of Pointe du Hoc. The capture of the guns here was critical to invasion success. Moving to the eastern end of OMAHA Beach, we will see the incredibly difficult high-ground facing the 1st Infantry Division at Colleville and we will follow their climb to the top of the bluffs for success against great odds. Atop the bluffs we will visit one of the most memorable, beautiful and awe-inspiring sites in American military history — the incomparable American Cemetery. Return to the charming Ferme de la Ranconniere for social hour and five-course dinner. Breakfast and check-out of lodgings. 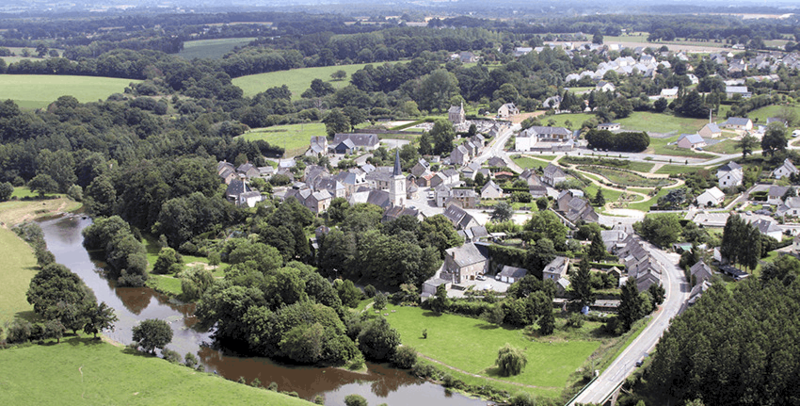 After six weeks of tough, difficult fighting the Americans finally captured St Lo in mid-July 1944 and we will visit the beautiful town center where the battle of Normandy began its final phase – the breakout! The gorgeous market town has many incredible sites, including the rebuilt cathedral and memorials to its American liberators. 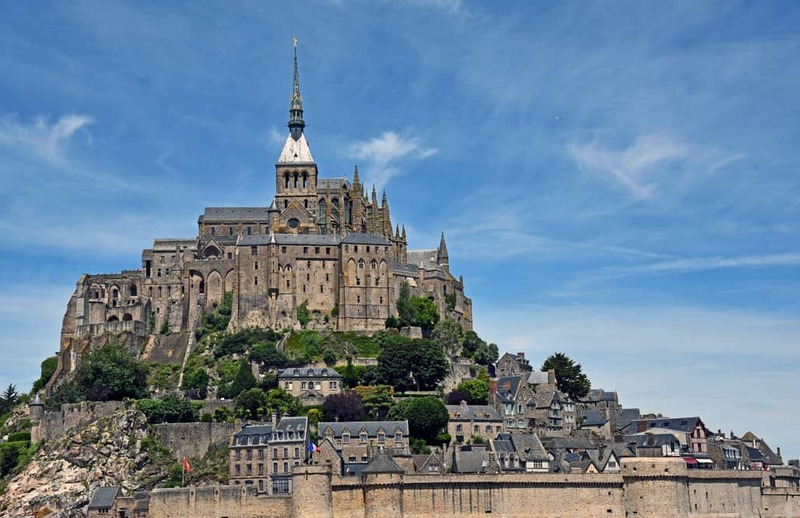 Next, we will visit the stunning Mont Saint Michel, home of the still-active abbey and monastery built in the 8th century. We will enjoy lunch overlooking the famed tidal area. Continuing on, we will cross from Normandy into Brittany and arrive at the famed port town of Saint Malo and conduct a walking tour of the downtown, scene of the recent best-seller All the Light We Cannot See. It is also a port known for its centuries of sending out privateers and corsairs to prey on English and other shipping! Check-in to Saint Malo lodgings, the five-star Grand Hotel des Thermes where you will enjoy an incomparable ocean view from your Prestige rooms. Social hour and dinner in St Malo. 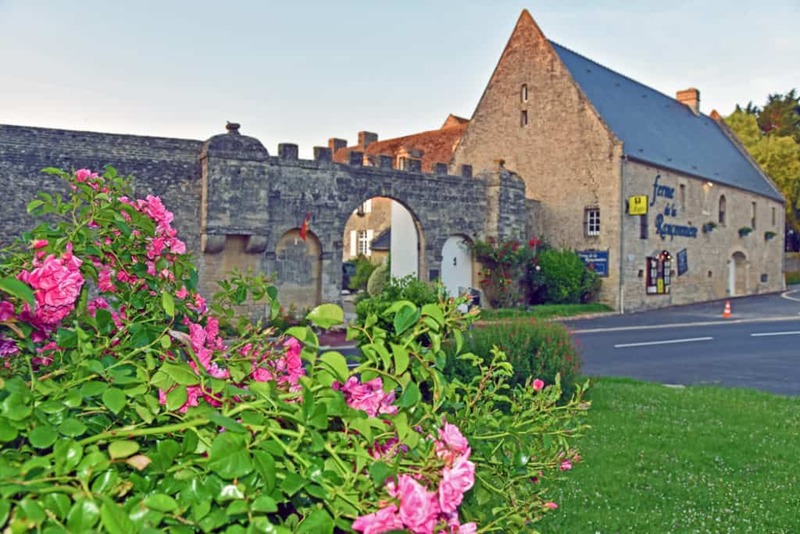 Drive to St-Fraimbault and visit this beautiful market town famed for its August flower festival and as one of the top “Unspoilt Villages’ in all of Normandy! Visit the Mont Ormel Museum. From the heights of Ormel we will be able to see much of the valley that became known to history as the “Falaise Gap.” It was here that the Allied armies destroyed the German Army in the west in August 1944, ending the Battle of Normandy. Today, the views of the beautiful Norman countryside belie the fighting. Check-in to the lovely junior suite lodgings at Le Clos in Verneuil. INTERESTED IN CUSTOMIZING YOUR OWN TOUR? Let’s set up a conference call! We would love to chat with you and answer any questions you may have. Just complete the contact form below and let’s set up a call.